07/15/2013- Silverton- The road up to the Bullion Mine gets steep and narrow in places to the point of folding in the mirrors of the Jeep. 07/15/2013- Silverton- The Bullion Mine at 12,400 feet, northwest of Red Mountain, is in line to have the pile of waste relocated and buried away from any water flow. 07/15/2013- Silverton- Chris Peltz, scientist with Research Services, left, and Kirsten Brown, with the Colorado Division of Reclamation and Mine Safety, survey the Bullion Mine at 12,400 feet, northwest of Red Mountain. The two are discussing the plan of action to have the pile of waste relocated and buried away from any water flow. 07/15/2013- Silverton- Kirsten Brown, with the Colorado Division of Reclamation and Mine Safety, talks about the kind of mine waste at the Bullion Mine at 12,400 feet, northwest of Red Mountain. 07/15/2013- Silverton- Signs of life appear beneath the water in mine waste sludge at the Bullion Mine. 07/15/2013- Silverton- The Bullion Mine at 12,400 feet, opens towards Red Mountain with a beautiful view of the valley. 07/15/2013- Silverton- Chris Peltz, scientist with Research Services, left, and Kirsten Brown, with the Colorado Division of Reclamation and Mine Safety, survey the Bullion Mine at 12,400 feet, northwest of Red Mountain. During snow melt and heavy rains, portions of the waste pile carry down the mountain side loading metals in to area creeks. Getting heavy equipment to the site will be a challenge as the road to the mine narrows in places. 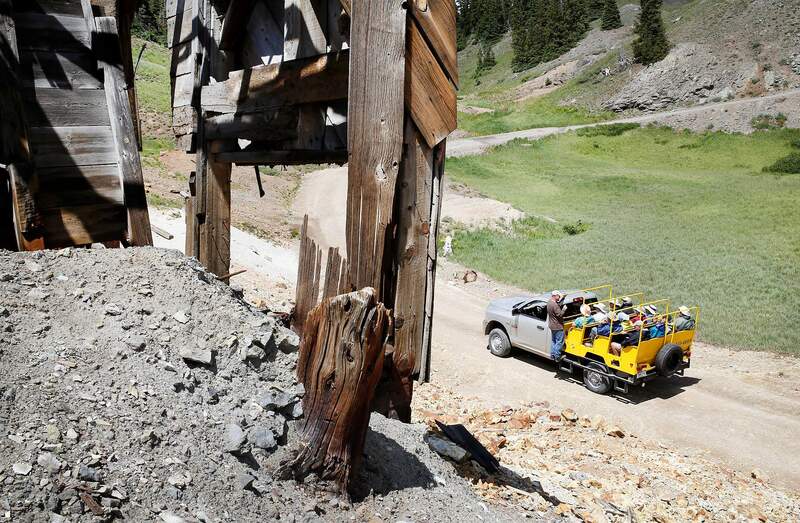 07/15/2013- Silverton- The Bullion Mine at 12,400 feet, northwest of Red Mountain was dug near timberline. But now abandoned its waste pile sits surrounded by alpine flowers. The mine in line to have its pile of waste relocated and buried away from any water flow. The Bullion Mine is one of many problem mines that remain. After Sunnyside Gold Corp. shut down operations at American Tunnel in 1991, Silverton executed a bittersweet pirouette: With mining, its main industry, seemingly done for, the town focused on selling its mining history to tourists. Today, thousands of visitors pour into Silverton every summer, disembarking from the Durango & Silverton Narrow Gauge Railroad to tour mines, shop or playfully pan for gold. Meanwhile, Silverton’s abandoned mines gush toxic metals into Cement Creek, among the largest untreated mine drainages in Colorado. In turn, the metal pollution in Cement Creek is choking off the Upper Animas River’s ecosystem. Steve Fearn, a Silverton resident and a co-coordinator of the Animas River Stakeholders Group, said the people of Silverton want mining to return. This desire, he said, partly accounts for why many residents oppose federal involvement in the cleanup of Cement Creek. In the view of mining companies, a Superfund site designation would make Silverton’s metal mines infinitely less attractive, he said. Bev Rich, chairwoman of the San Juan County Historical Society and San Juan County treasurer, is the daughter of a miner, and she married one. She said it isn’t surprising that many people in Silverton look on Sunnyside Gold, the last mine to close there, with nostalgia for the good days, not anger about the mine drainage. And she said while Silverton’s eagerness to see a resumption of mining might confound outsiders, they don’t have first-hand knowledge of Silverton’s past. On the pay scale, tourism jobs can’t compete with mining work. “It was $60 or $70 an hour towards the end,” she said about the wages Sunnyside once paid. She also said she doesn’t believe metal concentrations in Cement Creek are a problem chiefly created by mining pollution. “I look at it as mineralization. It’s always been a heavily mineralized area,” she said, an observation repeated by Rich’s fellow Silvertonians Fearn and San Juan County Commissioner Peter McKay. Fearn and Rich said the town’s economy was seriously enfeebled by mining’s departure in 1991. San Juan County’s population fell 43 percent between 1984 and 1994, dropping from 951 residents to 554. With the help of tourism, the county’s population has stabilized at an estimated 690 residents in 2012. But economically, the situation is more dire: While the average value of a San Juan County home is $259,500 compared with a state average of $236,700, median income in San Juan County is well below the state average. Also, while 12.5 percent of Coloradans live in poverty, nearly a quarter of residents in San Juan County do. Peruse the shelves of Silverton’s library, and it is easy to see why Silvertonians today remember mining as more good than bad: Historians tend to treat the mining industry as the heroic protagonist of Silverton’s story, placing the people of Silverton in an adjunct role. In miner-turned-historian Allan Bird’s book, Silverton Gold, Silvertonians seem to die in droves every few paragraphs, losing five Italians to avalanche on page 102 with snow sweeping 12 more miners and their boarding house off a mountain just a few pages later. Silverton’s tourist literature often takes Bird’s approach, mentioning lives lost to fire, cold, avalanche, suffocation and machine mishaps seemingly to illustrate Silverton’s robust town character, not mining’s historic indifference to human life. In histories of Silverton, even gross environmental malfeasance is forgiven. Bird writes that in 1974, one of Silverton’s main tailing ponds was breached, causing 100,000 tons of gray sludge to flood the Animas River, washing away a part of the highway, and prompting regulators to fine the mining company. Bird acknowledges that had Lake Emma not “disappeared” on a Sunday, the lake falling into the mine would have killed the 125 men who usually worked there. Yet Bird describes Lake Emma’s draining as a “major physical disaster” that “struck” Sunnyside Mine – not as a major environmental disaster brought about by Sunnyside Mine that might have resulted in mass human casualties. Historian Duane Smith, a Durango resident and Fort Lewis College professor who has written several books about Silverton, said Silvertonians’ attitude toward mining spoke to the keen survivalist instinct of a hard-luck mountain hamlet. Smith said it was naive to expect Silverton residents to re-imagine the town’s future as one without mining simply because mining could be brutal. Fearn, a mining engineer, said he wants mining to return to Silverton to show the world that modern mining can be done safely and profitably. “If we’re not willing to do it in our own backyard, then we shouldn’t be taking things from other parts of the world, from people who can’t defend themselves,” he said. He said going forward, mining could be safe as well as profitable. “It is not the 1880s, after all,” he wrote. But some other members of the Animas River Stakeholders Group, an organization dedicated to improving water quality in the Animas River, were less convinced of mining’s viability in Silverton. But he noted that while demand for metal has grown with the globalization of manufacturing, mining officials in the 21st century have, on the global scale, tended to continue to seek out the conditions that made mining so profitable in Silverton in the 19th and early 20th centuries: places with little regulation, where metals, like human life, are cheap and abundant. Kinross Gold Corp., the mining company that bought Sunnyside and made more than $4 billion in revenue last year, is still considering whether it should expand its mill in the Tasiast gold mine in Mauritania, Africa. Fearn said Silverton’s hope that mining will return amounts to a cry for life. He said the problem is that tourism – Silverton’s primary industry since mining’s departure – is inadequate, creating minimum-wage jobs that can’t support families. He also said his support for mining’s return isn’t derived from hopes for personal financial gain. 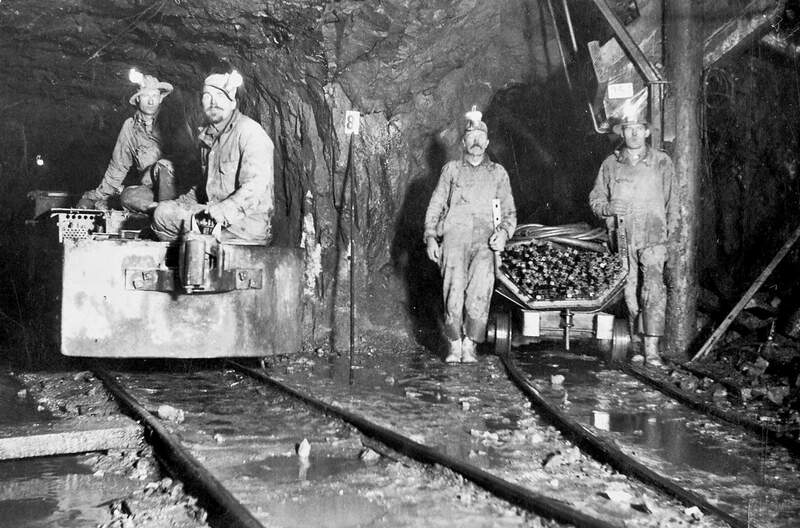 Industrial mining has played a large role in Silverton since the 1870s. Miners in the Silverton area stop their work to pose for a picture around 1900. The area’s last big mine closed in 1991, but many in town want to see the industry return. Sunday: How serious the problem is and why it’s been so difficult to fix. Also, why Silverton has resisted federal money and the Superfund label that would come with it. Monday: Possible solutions and who might pay. Also, successes in cleaning up mines in the Mineral Creek drainage. TODAY: Silverton’s mining history lures tourists. Faced with a difficult environmental challenge, residents talk about bringing the industry back after a 22-year absence. 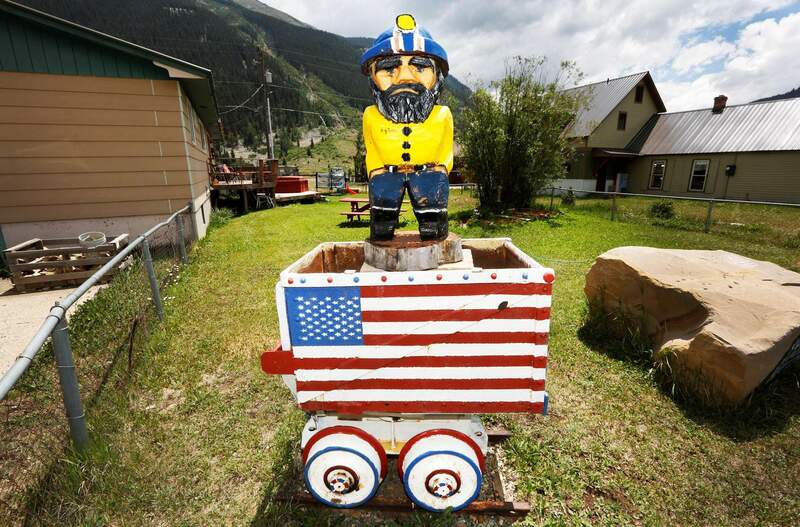 A wooden sculpture, standing in an ore cart once used to carry riches from the surrounding mountains, decorates a front yard in Silverton. The rich mining history around Silverton draws thousands of tourists each year. A tour group stops in front of the Congress Mine recently. Others make off-road adventures on their own. 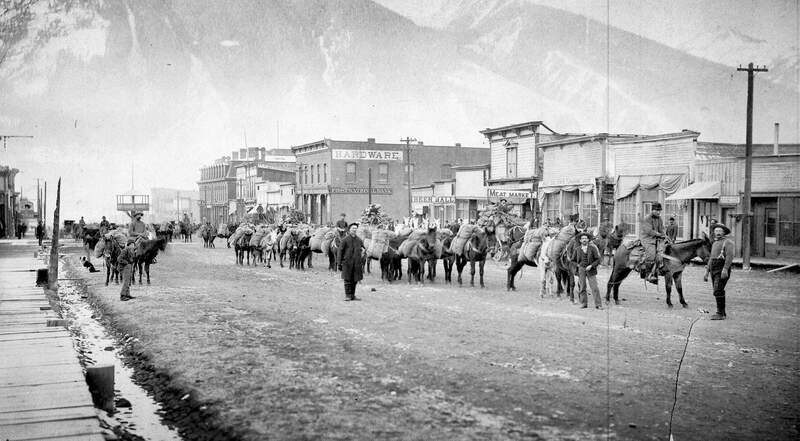 A pack train makes its way through Silverton on the way to a mine, circa 1890. The area’s last big mine closed in 1991, but many in town want to see the industry return.